We are delighted to announce the full cast for the upcoming tour of our acclaimed musical Reasons to be Cheerful, which will hit the road one final time this autumn. The extraordinary wit and wisdom of Ian Dury and the Blockheads’ music and lyrics will be brought to life by an inclusive cast of 14 actors and musicians. 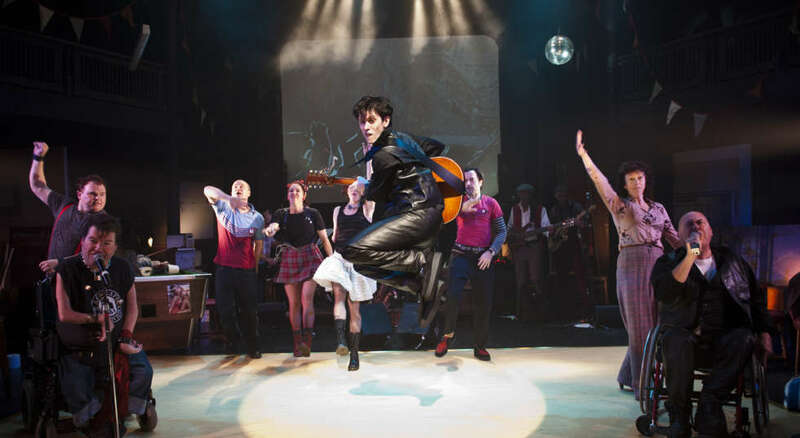 Artistic Director, Jenny Sealey will direct a mix of performers who originated the show in 2010, those who joined the cast subsequently and newcomers to Reasons to be Cheerful. Beth Hinton-Lever will play Janine in her Graeae debut, while Gerard McDermott (Blood Wedding and Blasted for Graeae), Joey Hickman (The Threepenny Opera for Graeae) and Max Runham (Captain Walker in Tommy for Ramps on the Moon) will also join the company. Reprising their roles from the hugely successful 2010 and 2012 tours, Stephen Lloyd will play Vinnie alongside Stephen Collins as Colin, Dan McGowan as Nick/Dave, Karen Spicer as Pat, Wayne ‘Pickles’ Norman as Pickles and Jude Mahon in the role of Debbie. With John Kelly on lead vocals, the on-stage band is completed by Paul Sirett (Guitar, also writer), Nixon Rosembert (Bass) and Paula Stanbridge-Faircloth (Drums). ‘Directing Reasons to be Cheerful remains one of my career highlights. I am delighted that we’re not only reuniting many of the original cast members, but also welcoming the gloriously talented Joey Hickman, Gerard McDermott and Max Runham to the company. We are always aiming to work with Deaf or disabled artists new to Graeae, so are thrilled that Beth Hinton-Lever will also be joining the family. Keep an eye on our website, twitter and facebook accounts for more information!